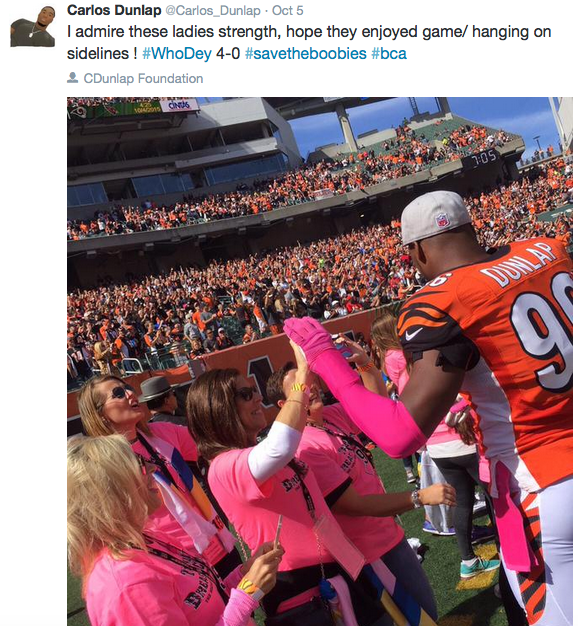 Carlos Dunlap is a star defensive end for the Cincinnati Bengals. In addition to terrorizing quarterbacks on Sundays, Carlos -- a University of Florida alumnus and former second-round draft pick -- is very active in the community. He recently utilized his great foundation to help cancer fighters to a special day. He was gracious enough to sit down with AOL.com to discuss what his outreach has meant to him and why he enjoys helping others. Q: How did you develop such a soft spot for BCA? A: I realized how many people are affected by it and how many people don't get checked. One of my childhood friends, his mother passed away from breast cancer and it was devastating. It's something, they say, that's easily preventable and people just need to get checked. Q: How has your foundation chipped into the cause? A: We greeted 10 cancer fighters and survivors for a fun day, and I went and got pedicures with them. They were able to get facials, manicures, pedicures, massages, whatever they wanted. It was just a fun spa day at one of the best spas in the city. Q: For the Dunlap foundation, there are many parts to the operation. Can you tell me what goes into the Dunlap Scholars? A: The Dunlap Scholars is a program where I challenge student-athletes to a certain GPA as well as getting involved with their community. They pledge to do all the commitments and periodically, throughout the year, we'll do random events. We'll show up to their games, my teammates and I will show up to their schools, I'll call them before their games or before a big test. We'll invite them to games, take them to Reds games -- it all goes with what's in season. My foundation is based on education. We help with getting the kids tutors, we mentor them, we help them get ready for college and give them a clear and level mind. I also have my chef teach them nutritional courses because a lot of them told what they ate before games -- and it wasn't ideal. It just proves that we have various things we do to help others. Q: Did you start this foundation in your rookie year? A: I started this year. But ever since I was in the league, I went and hosted a football camp back home. It had a major impact on the community and I wanted to do more. That's how the foundation was started. Q: What kind of mentors did you have growing up and what was the motivation behind starting all your community work? A: What inspired me was, growing up, realizing what we didn't have and understanding the difference it would've made it those things were there. I don't want anybody settling and I want to bring out the best in themselves. My mentor was my dad and he always told me to work hard. Q: You didn't get a ton of playing time early on in your career. Then, thanks to some injuries, a chance opened up and you took it. What did that teach you about patience and hard work? A: Absolutely. There's a couple events in my life that always stick with me, some I'm not proud of. But the big thing is a mistake is a mistake only if you let it happen once. If you repeat it again, it becomes a habit and more than a mistake. I teach others to work hard off the field too. They're all hard-working on the court or in games, but the males and females in my program, I challenge them to compete and give perfect effort -- in life, not just games. Q: The Bengals are off to a hot start. What about this team makes it so special this year? A: We've been in the league five years now, a lot of us. We grew together and then fought our way into the playoffs. Now we have good experience of actually playing and our core is young. Andy Dalton, AJ Green, myself and others -- we built this team through experience.